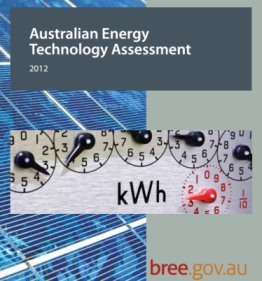 The Australian Energy Technology Assessment 2012 (AETA), published by the Australian Bureau of Resources and Energy Economics (BREE), reported on cost estimates for 40 electricity generation technologies. The AETA cost estimates were developed with the active collaboration of the Australian Energy Market Operator (AEMO) that has also used some of the AETA cost estimates for its National Transmission Network Development Plan (NTNDP). In addition, the Commonwealth Science and Industry Research Organisation (CSIRO) provided technical advice as part of the AETA project steering committee and the modelling framework for projecting changes in technology costs over time. Estimated costs of several fossil fuel-based electricity technologies differ from previous studies, primarily as a result of a carbon price and higher projected market fuel prices. Estimated costs of solar photovoltaic technologies have dropped dramatically in the past two to three years as a result of a rapid increase in the global production of photovoltaic modules. Differences in the cost of generating electricity, especially between fossil fuel and renewable electricity generation technologies, are expected to diminish over time. Biogas and Biomass electricity generation technologies in 2012 are some of the most cost competitive forms of electricity generation and are projected to remain cost competitive out to 2050. By 2030 some renewable technologies, such as solar photovoltaic and wind on-shore, are expected to have the lowest LCOE of all of the evaluated technologies. Among the non-renewable technologies, combined cycle gas (and in later years combined with carbon capture and storage) and nuclear power, offer the lowest Levelised Cost of Electricity (LCOE) over most of the projection period and they both remain cost competitive with the lower cost renewable technologies out to 2050.
emissions, increased costs are projected from assumed increases in the carbon price out to 2050. The results indicate that Australia’s energy future is likely to be very different to the present. This has profound implications for electricity networks, how energy is distributed and Australia’s ability to meet its targeted greenhouse gas emissions reductions. This page was last modified 12:53, 2 August 2012.